The inner copper tube of a double tube heat exchanger was fitted with zinc rings transverse to the flow of saline water to protect the inner tube against corrosion by sacrificial cathodic protection. Rate of Zn consumption during cathodic protection of copper in NaCl solution was determined under different operating conditions. The rate of dissolution of Zn rings surrounding the inner copper tube was found to increase with increasing solution flow rate, temperature and NaCl concentration. Activation energy Ea was found to be 3.864 kCal/mol, this value shows that Zn consumption takes place through a diffusion controlled mechanism. The rate of zinc consumption was found to decrease with increasing ring thickness. The rate passes through a maximum with increasing ring spacing. The importance of the present study in assessing the cost of sacrificial cathodic protection in comparison with the competing impressed current cathodic protection was highlighted. 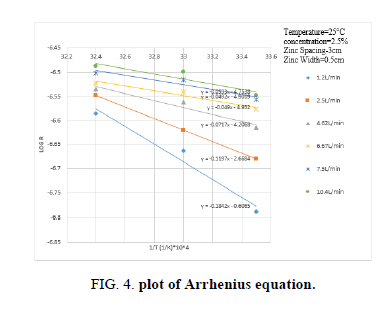 Also, the possible rate of zinc rings as turbulence parameters to enhance the rate of heat transfer and increase the efficiency of the heat exchanger was pointed out. Copper and copper alloys are usually used to fabricate heat exchangers in view of their high thermal conductivity and relatively low cost. Unfortunately, the rate of corrosion of copper and copper alloys is high in sea water (3.5% NaCl) used as a coolant in the cooling system of a marine vessels and coastal plants. Also heat exchangers used in desalination plants where NaCl concentration exceeds 3.5% suffer from severe conditions . Corrosion control is a process in which humans are very much in control of materials and environments can regulate the rate of corrosion, keeping it within acceptable or at least predictable limits for life of the structure . There are many methods for corrosion control such as (cathodic protection, anodic protection, protective coating such as paint, corrosion-resistant metals and alloys, addition of inhibitors, very pure metal). The selecting method depends on many factors such as cost, efficiency, availability, contamination of environment with corroding metal, etc. [3,4]. There are two proved methods of applying cathodic protection: Sacrificial anode (galvanic) and impressed current. Each method depends upon a number of economic and technical considerations and as certain advantages. For every structure, there is a special cathodic protection system dependent on the environment of the structure . Current distribution in cathodic protection system is dependent on several factors, the most important of which are driving potential, anode and cathode geometry, spacing between anode and cathode and the conductivity of the aqueous environment which is favorable toward good distribution of current . Cathodic protection is normally applied on the exterior surfaces of pipelines, ships' hulls, jetties, foundation piling, steel sheet-piling and offshore platforms. Cathodic protection is also used on the interior surfaces of water-storage tanks and water-circulating systems. However, since an external anode will seldom spread the protection for a distance of more than two or three pipe-diameters, the method is not suitable for the protection of small-bore pipework. Cathodic protection has also been applied to steel embedded in concrete, to copper-based alloys in water systems and exceptionally to lead-sheathed cables and to aluminum alloys, where cathodic potentials must be very carefully controlled [7,8]. Equipment used in the desalination and cooling systems which uses saline water as a coolant suffers severely from corrosion owing to the presence of the highly aggressive chloride ions in high concentration [9,10]. This problem can be solved by either using expensive alloys in equipment or by using cheaper alloys and applying cathodic protection, they are protected by cathodic protection with sacrificial anodes, therefore, hundreds of researches were done in the subject of cathodic protection system with sacrificial anode, but few of them were dealing with the presence of bacteria in these systems [10-12]. Cathodic protection can also be applied in crude oil industry as the industry suffers a lot of corrosion problems, crude oil transportation has become a complex and highly technical operation . Reports around the world have confirmed that some oil companies had their pipelines ruptured due to corrosion [14,15]. Corrosion is worth investigating in oil field applications, because corrosion problems represent a large portion of the total costs for oil producing companies every year worldwide [16-19]. Recent industrial catastrophes have it that many industries have lost several billions of dollars as a result of corrosion. The total annual cost of corrosion in the oil and gas production industry is estimated to be in billions, broken down into million in surface pipeline and facilities cost, millions annually in down hole tubing expenses . In petroleum industry, general and localized corrosion are the most common types of corrosion occurrences. The other large problem in operating pipelines is internal corrosion [16,20,21]. The crude oil explored from reservoirs generally contains water, exactly brine. Before water separation, the oil-brine mixtures need to be gathered and transported by pipelines to the treatment stations. However, the transport pipelines would be suffered from corrosion attack [22,23]. Corrosion would be much serious when acid gases such as (CO2, H2S) are introduced into the transporting systems [22-25]. At low water cuts this is not an issue as water-in-oil dispersion are observed. As the water cut increases, water "break-out" may occur, leading to stratified flow of separate layers of water and oil phases. Consequently, the possibility of corrosion is very high where the water phase wets the pipe wall [26,27]. Produced water occurs in two ways: some of the water may be produced as free water and some of the water may be produced in the form of emulsions. Produced oil-field emulsions can be classified into three groups: [13,28,29]. The present study would assist in comparing to between the impressed current cathodic protection and sacrificial cathodic protection for double tube heat exchanger handling saline solutions. While electrical energy consumption constitutes a major cost item in impressed current cathodic protection, zinc consumption is the major cost item in sacrificial cathodic protection. The aim of the present work is to explore the possibility of using sacrificial cathodic protection to protect the internal copper tube of a double tube heat exchanger against corrosion in NaCl solutions. To this end zinc rings were fitted to the internal copper tube at regular intervals. In order to assist in assessing the economic feasibility of using Zn consumption was determined under different conditions of salt concentration, solution flow rate, temperature and Zn ring dimension by spectrophotometer analysis of the dissolved zinc. The use of zinc rings surrounding the internal copper tube has also the advantage of promoting turbulence which enhances the rate of heat transfer between the inner and the outer solution. An apparatus was installed to be able to monitor the rate of corrosion of anodes in an electrochemical cell through cathodic protection depending on galvanic series of metals. The apparatus was built to simulate the electrochemical cell where the anode will be scarified to protect the cathode. The apparatus consists of water tank with dimension 27 cm × 27 cm × 27 cm cm made of PVC with capacity 19.6 L, where the water flows from the water tank by a plastic centrifugal pump which is ¼ horse power to the reaction cell where the copper rod act as cathode with 20 cm length and 21 mm diameter fitted in zinc rings act as anodes inner diameter 21 mm which were fitted by external force, this reaction cell is made of Plexiglas and have two over weirs made of PVC where the water flows back to the water storage tank as shown in Figure 1. *1. Electrical source, 2. Electrical heater, 3. Saline water tank, 4. Electrical pump, 5. Pump recycle valve, 6. Recycle feedback pipe, 7. Overflow feedback pipe, 8. Reaction cell, 9. Zinc rings, 10. Copper rod, 11. Wax stopper, 12. Tank drain, 13. Pump discharge valve, 14. Back overflow to water tank, 15. Holding stand, 16. Tank drain valve. Before each run 12 liters distilled water were added to the water tank, with the required mass fraction of NaCl, the water temperature was adjusted at the required temperature by using the electrical heater, the flow was adjusted by adjusting the valve. The experiment starts after adjusting the variables, after 60 min a sample of 30 ml is withdrawn from the water tank and at the end zinc rings are washed with water to remove zinc traces. Different parameters studied: solution flow rates (1.2, 2.5, 4.62, 6.67, 7.5 and 10.4) L/min, temperatures varies from 25°C to 35°C, concentration varie s from 2.5 wt% to 7.5 wt%), spacing (3 cm, 4 cm and 5 cm) and width (0.5 cm, 1 cm and 1.5 cm). Atomic absorption device was used for the analysis of the anode (Zn) samples. Zinc dissolution takes place under the present conditions through galvanic cell. A is the area (cm2). Figure 2 shows that the rate of consumption of zinc rings contacting the inner copper tube increases with increasing solution flow rate and NaCl concentration. The increase in the rate of zinc consumption with increasing solution rate is ascribed to the increase in the rate of mass transfer of dissolved oxygen from the solution bulk to the cathode surface where the diffusion controlled oxygen reduction reaction takes place , increasing solution flow rate reduces the diffusion layer across which O2 diffusion takes place according to the equation (2). 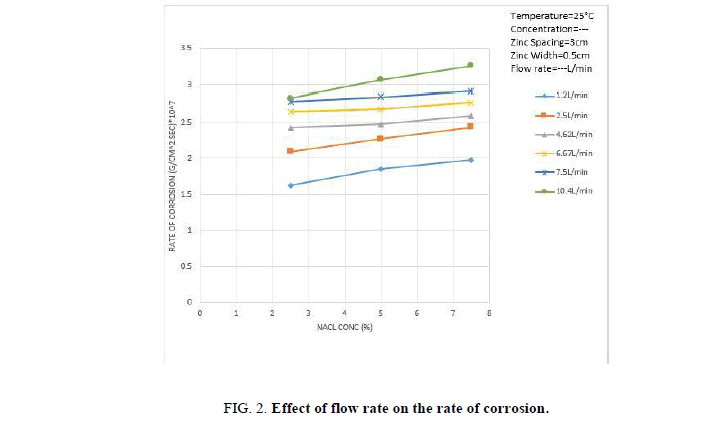 Figure 2: Effect of flow rate on the rate of corrosion. In addition, as the flow crosses the zinc rings hydrodynamic boundary layer separation takes place downstream of the rings with the formation of turbulent wake , the turbulence generated by boundary layer separation penetrates the diffusion layer and enhance the rate of mass transfer furthermore. 2-According to Arrhenius equation increasing the solution temperature should lead to increasing the rate of Zn dissolution. It seems that under the present conditions effect 2 outweighs effect 1, i.e. the rate of Zn dissolution increases as shown as in Figure 3. 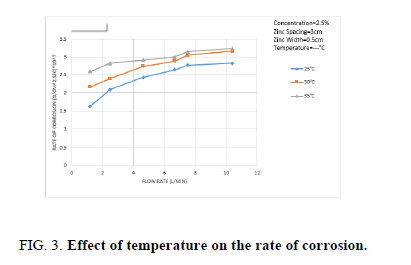 Figure 3: Effect of temperature on the rate of corrosion. Figure 4 shows that the present data fit Arrhenius equation R’’=A e-Ea/RT with activation energy of 3.864 Kcal/mole this value shows that Zn dissolution through Zn/NaCl/Cu takes place through a diffusion controlled mechanism . R’’ is rate constant, A is frequency factor, Ea is activation energy, R is universal gas constant and T is the absolute temperature. Figure 4: plot of Arrhenius equation. 2-As NaCl concentration increases the solution conductivity increases, solution resistivity decreases since the corrosion can be approximated by ohm’s law. Where E=Potential difference between the two electrodes of the cell (Zn/NaCl/cu). The decrease in solution resistance R tends to increase the corrosion current and the rate of Zn dissolution. The increase in the rate of Zn dissolution with increasing NaCl concentration as shown in Figure 5 indicates that effect 2 is predominating effect 1. 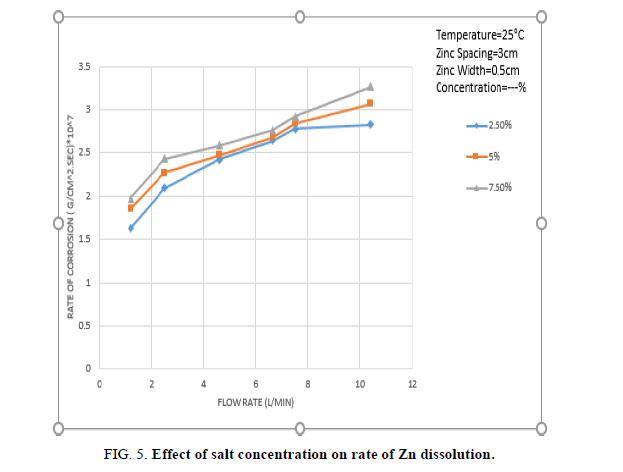 Figure 5: Effect of salt concentration on rate of Zn dissolution. 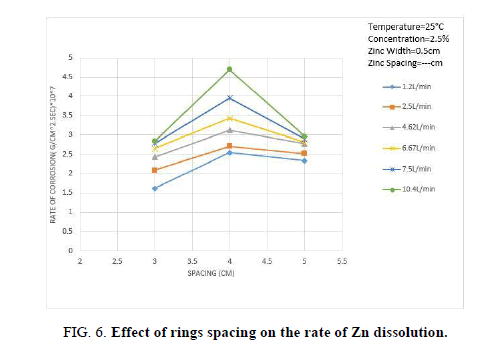 Figure 6 shows the effect of ring spacing on the rate of Zn dissolution, the rate of Zn dissolution increases with increasing spacing, it reaches the maximum then starts to decrease with further increase in spacing. The initial increase in the rate of Zn dissolution may be attributed to the fact that turbulence wake generated downstream of each ring has a better chance of reattachment with the copper cylinder as the spacing increase. Previous studies on turbulence promoters have shown that the mass transfer becomes maximum at the point of reattachment . As the spacing increases furthermore, the hydrodynamic boundary layer thickness increases after the point of reattachment with a consequent increase in the diffusion layer thickness. As a consequence, the rate of oxygen reduction at the cathode and the rate of Zn dissolution decrease. Figure 6: Effect of rings spacing on the rate of Zn dissolution. Figure 7 shows the effect of ring width on the rate of Zn dissolution, the data show that the rate of Zn dissolution increases with decreasing ring width, this may be attributed to the fact that this ring of small width dissolves mainly from the downstream flat side which is highly turbulent (because of boundary layer separation) while thick rings of large width dissolves from the cylindrical part parallel to the flow as well as from the downstream flat side. Figure 7: Effect of rings width on the rate of corrosion. The rate of dissolution of the cylindrical part of the ring is lower than that of the downstream flat area because the intensity of turbulence at the cylindrical part of the ring is less than the downstream flat part of the ring. 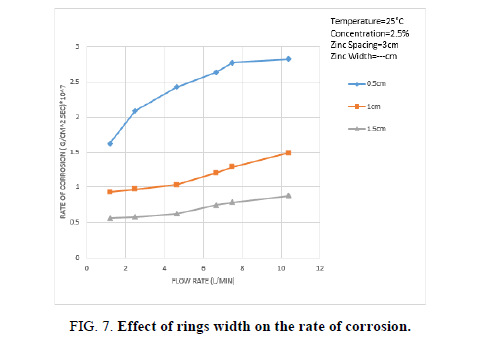 The factors affecting the rate of corrosion for the sacrificial anode were studied experimentally and the results observed show that as the temperature of the corrosion media increases the rate of Zn dissolution of the sacrificial anode increases. Increasing the salinity of the artificial saline water will increase the rate of corrosion. Rate of corrosion will increase while increasing the spacing between the anodes, then with further increase the rate of corrosion decreases. Also as the width for the anode increases the rate of corrosion decreases. Besides protecting the heat exchanger against corrosion, the zinc rings act also as turbulence promoters to enhance the rate of heat transfer from the outer side to the inner side of the copper tube. The present results which show that the rate of Zn consumption ranges from 0.5633 g/cm2s to 4.6966 g/cm2s would help the designer in estimating the cost of sacrificial cathodic protection in comparison with the competing impressed current cathodic protection. Future studies should include measuring the pressure drop across the tube fitted with the zinc rings to make sure that the increase in delta P and the cost of the pumping power don’t exceed the benefits gained by cathodic protection and heat transfer enhancement. Critchley JK. Cathodic Protection: Theory and Practice. In: Ashworth V, Booker CJ, editors. Wiley, USA; 1986.p:83. Trethewey KR, Chamberlain J. Corrosion for scientist and engineering. United Kingdom: Pearson Education Limited; 1996. Schweitzer AP. What every engineer should know about corrosion. USA: CRC Press; 1987. Bosich FJ. Corrosion prevention for practicing engineers. Barnes and Noble Inc. USA; 1970. Scully JC. The fundamental of corrosion. USA: Pergamon Press; 1975. Shrier LL. Corrosion 2 corrosion control. Butterworth-Heinemann; 1994. Halford GE. Introduction to cathodic protection. John Wiley and Sons Inc, USA; 1985. Aprael SY. Sacrificial anode cathodic protection of low carbon steel in sea water. J Eng. 2007;13:1780-90. Konsowa AH. Rate of zinc consumption during sacrificial cathodic protection of pipelines carrying saline water. Desalination. 2002;153:223-26. Aprael SY. Cathodic protection system of copper-zinc-saline water in presence of bacteria. Desalination. 2011; 270:193-8. Jones DA. Principles and Prevention of Corrosion. 1992. Pope D, Morris E. Mechanism of microbiological included corrosion (MIC). Materials Performance. 1995;34:24-28. Hasan SW, Ghannam MT, Esmail N. Heavy crude oil viscosity reduction and rheology for pipeline transportation. Fuel. 2010; 89:1095-100. Papoola LT, Grema AS, Latinwo GK, et al. Corrosion problems during oil and gas production and its mitigation. Ind Chem J. 2013;4-35. Oyelami BO, Asere AA. MATHEMATICAL MODELING: An application to corrosion in A Petroleum Industry. National Mathematical Centre. 2011. Finsgar M, Jackson J. Application-of-corrosion-inhibitors-for-steels-in-acidic-media for the oil and gas industry. Corr Sc. 2014;86:17-41. Osman MM, Shalaby MN. Some ethoxylated fatty acids as corrosion inhibitors for low carbon steel in formation water. Chem Phys. 2003;77:261-9. Okafor PC, Liu X, Zheng YG. Corrosion inhibition of mild steel by ethylamino imidazoline derivative in CO2-saturated solution. Corr Sc. 2009; 51:761-8. Nesic S, Sun W, Tony JAR. Sherri’s Corrosion. 2010;1270-98. Ghareba S, Omanovic S. Interaction of 12-aminododecanoic acid with a carbon steel surface: Towards thedevelopment of ‘green’ corrosion inhibitors. Corr Sc. 2010;52:2104-13. Olivares GZ, Gayosso MJH. Corrosion of steel pipelines transporting hydrocarbon condensed products, obtained from a high-pressure separator system: A Failure Analysis Study. Materials Sciences. 2015;6(8):760-72. Wang ZL, Zhang J, Wang ZM, et al. Emulsification reducing the corrosion risk of mild steel in oil-brine mixtures. Corr Sc. 2014;86:310-7. Larsen KR. Managing corrosion of pipeline that transports crude oil. Mater Perform. 2013;52(5):28-35. Nesic S. Key issues related to modelling of internal corrosion of oil and gas pipelines. Corr Sc. 2007;49:4308-38. Zhang J, Wang ZL, Wang ZM, et al. Chemical analysis of the initial corrosion layer on pipeline steels in simulated CO2-enhanced oil recovery brines. Corr Sc. 2012;65:397-404. Cai J, Nesic S. Modeling of Water Wetting in Oil-Water Pipe Flow. Texas NACE International. 2004;4663. Ayello F, Li C, Tang X, et al. Corrosion Conference and Expo. USA; NACE International. 2008;8566. Kokal S. Crude Oil Emulsions: A State-Of-The-Art Review. 2005;77497. Palou RM, Mosqueira ML, Rendon BZ et al. Transportation of heavy and extra heavy crude oil by pipeline. Pet Sc Eng J. 2011;75:274-2. Roberge PR. Corrosion Engineering: Principles and Practice. McGraw-Hill, USA; 2008. Beek WJ, Muttzall KM. Transport Phenomena. Wiley, USA; 1975. Atkins P, Paula J. Atkins Physical Chemistry. W.H. Freeman and Company. 2006. p:451. Benson SW. Foundation of chemical kinetics. J Chem Educ. 1960. Miyashita H, Murikawa K, Sugata M. Experimental study of the improvement of heat transfer coefficient using turbulence promoters. Int Chem Eng.1986;26:475-8.